The Dragon and I have established a wonderful morning routine. His alarm goes off on the hour, then we snooze for 10 minutes until mine goes off. We take turns getting up and getting breakfast and tea/coffee to bring to the other in bed by half past. We then eat breakfast in bed (no crumbs problems so far). We have snoozey cuddly time until ten to, when we both get up and get ready to leave the house about ten past. It starts the day with love and softness. Prior to living with the Dragon my mornings were often a stressful rush. I would press snooze for as long as I could get away with. Sometimes there was breakfast, but more often than not there was no time. I kept a store of Up-N-Goes to drink on the way to the train for these days. Now every day starts feeling decadent and relaxing. I’m in a much better place to start the day for work. What we eat has varied. Sometimes it is a piece of toast with vegemite or peanut butter. Sometimes its porridge with a little honey with/without chia seeds. Sometimes it is a breakfast smoothie. Sometimes it is cereal. Occasionally it is bacon and eggs. We had grand plans on omelettes but weekdays don’t really leave enough time (let’s be honest). 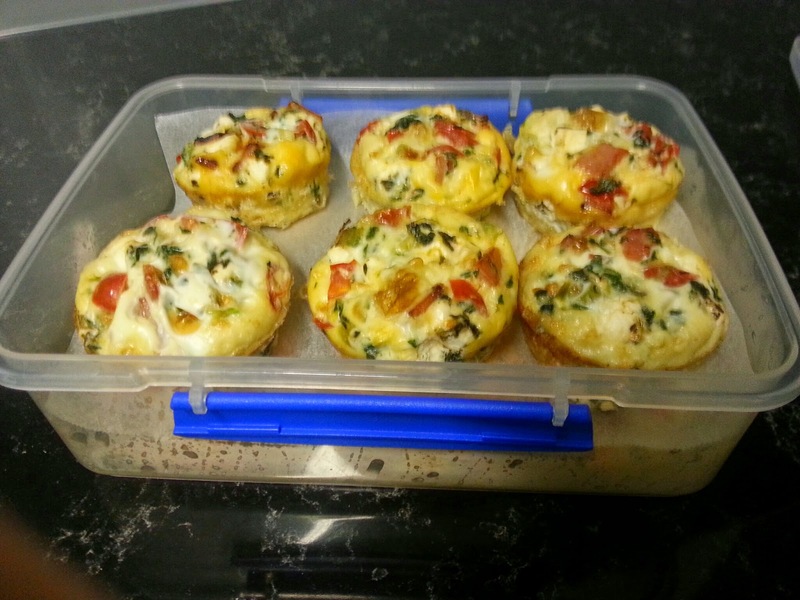 Recently I’ve been keen on maximising snuggle time and minimising breakfast prep time. We are both working on eating more healthily, exercising, drinking more water, drinking less alcohol, reducing our carbs and making sure we get all the nutrients we need every day. 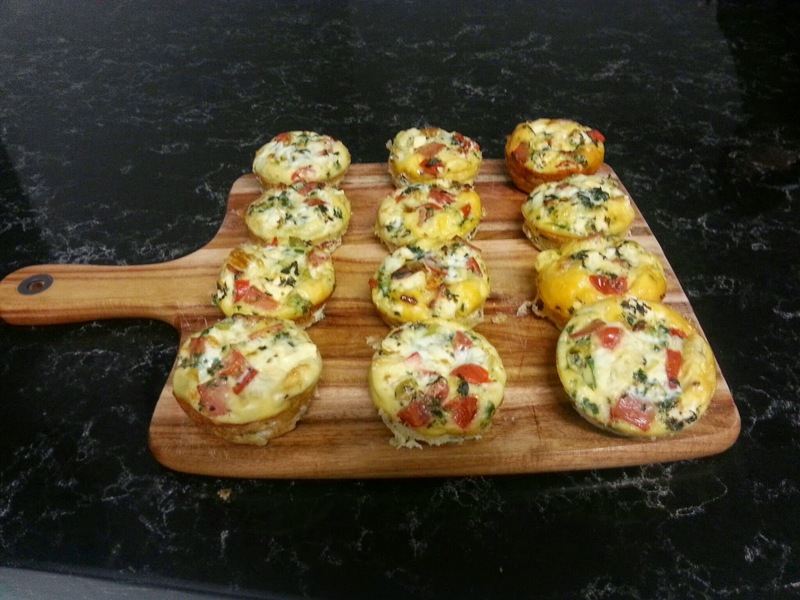 Here is a high protein easy and healthy breakfast which takes virtually no time in the morning. I made these while we cooked dinner one night – a curry which didn’t need a lot of chopping but needed a fair bit of simmer time, so it was no hassle. And makes LOADS. I don’t tend to use exact measurements of anything so please adjust my recipes to what seems right to you. I always do 😉 I see recipes as a starting point for negotiations, so all of mine will be posted as such. Makes 12 individual portions if you have one each, or 6 portions if you have 2 each. You could customise this dish so many ways. 4 x shortcut bacon, diced and pre-cooked. You could add or subtract anything to make this your own – eg chia seeds or other super foods, red or brown onion, cooked or BBQ chicken, sun dried tomatoes, herbs, capsicum/peppers, low fat grated cheese instead of feta, spices (a bit of cayenne pepper or chili would kick start the metabolism for the day), real wilted spinach instead of the frozen kind, corn, zucchini, mushrooms – anything really. Pre-heat oven to 190 degrees Celsius/395 degrees Fahrenheit. 1. 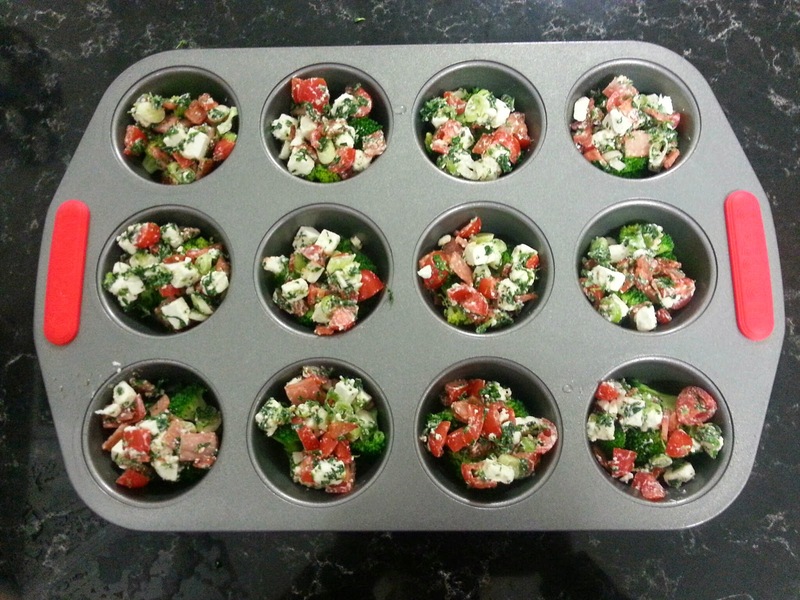 Spray a 12 muffin tray with a small amount of spray virgin olive oil. If your muffin tray doesn’t have good Teflon, you may consider putting a little circle of baking paper in the bottom of each muffin. 2. Nuke the broccoli in the microwave in a small amount of water for 3 minutes. It should come out a vibrant, bright green. Drain. Alternatively you could steam the broccoli. 3. 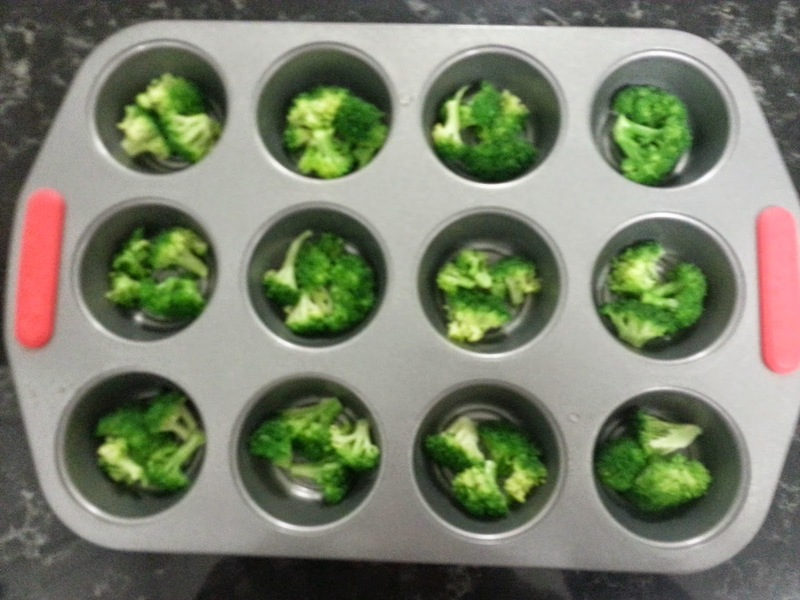 Place a small amount of broccoli into each muffin tray hole. 4. 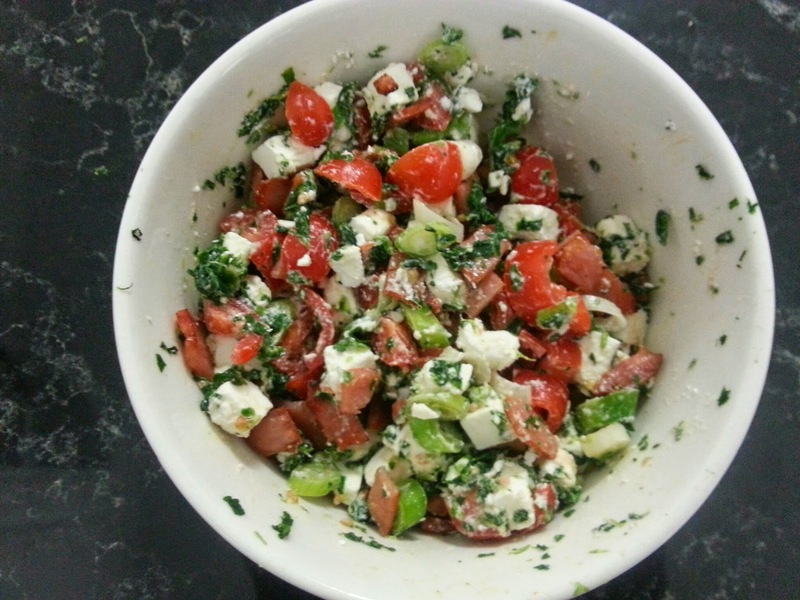 Mix spring onion, tomatoes, feta, spinach, cooked bacon in a dish. 5. Add a portion of the mix on top of the broccoli. 6. Beat eggs and milk in a small bowl. I didn’t add salt or pepper, but you may prefer to do so. If you wish to add spices, salt and/or pepper, now is the time to do so. 7. Pour egg mix evenly onto the veggies and feta. If you need more, mix more eggs and milk. I found this to be enough but it really depends on the size of your muffin tray. I found that small muffins are actually quite filling. 8. Bake for 30 mins or so or until set. I ran a knife around the edges (backwards so it didn’t scratch the teflon) to ensure that they came out easily. Allow to cool then store them in the fridge in an airtight container with a piece of baking paper between each layer to prevent they from sticking to each other. All that is required to make breakfast in the morning is to nuke a serving for 1 minute while the jug is boiling. Or have it cold straight from the fridge if you are in a big rush. You can fancy it up with some side avocado/smoked salmon/bacon/tomato relish/sour cream/guacamole/salsa or whatever you like. Or just have it on its own like we do. They were quite tasty and I’m looking forward to exploring with more flavours. These filled me until lunch. I hope you enjoy and get creative with your own! Warning: I don’t think these would freeze well so don’t get too carried away with making too many batches at once. 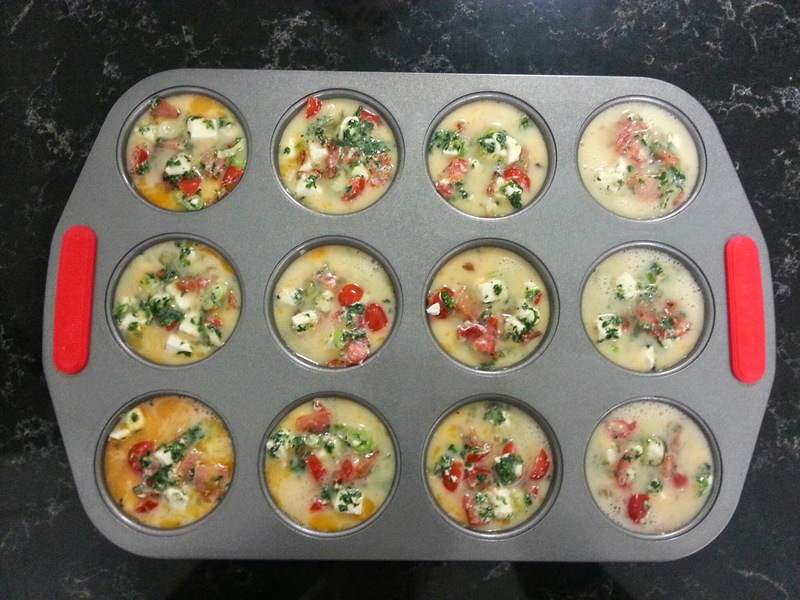 What ideas have you used for breakfast muffins?